World Tendency influences difficulty and controls additional events that occur in each world. World Tendency is independent of Character Tendency (available HP is the exception). Actions which affect World Tendency only have an effect on the World in which they occurred. World Tendency changes only take effect upon returning to the Nexus. So, if World Tendency is Pure Black, everything will remain in that state until the player returns to the Nexus, when any events affecting World Tendency will register. World Tendency carries over to New Game+. Pure White Tendency enemies are easier to kill, but drop fewer, less valuable items and hold the least number of souls. Healing items are dropped more frequently. Pure Black Tendency enemies are tougher, but drop more valuable items in greater abundance. They hold the largest number of souls. Earning all Trophies is only possible by changing World Tendency. There is a server median which appears to be calculated by accounting for World Tendency events across the network in aggregate. For instance, if a large number of players are doing things in their World which change their World Tendency towards Black, then the server median will reflect this. Likewise for all White Tendency events. actions. When you quit that game, your current World Tendency status is lost to you. On starting a New Game offline, all Worlds will be Neutral. 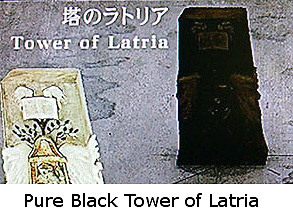 World Tendency will then shift towards Black or White according to the player's actions. The server median has no effect while playing offline. When you load a game, your World Tendency status will be exactly the same as when you last quit that game. White World Tendency has the following effects. Enemies drop more healing items. See the list of White World Tendency Events. Black World Tendency has the following effects. Black Phantom versions of normal monsters have a 100% drop rate for their primary items. Primeval Demons appear in specific locations in each world. Note that Primeval Demons will appear slightly before a world is Pure Black, so this is not a good way to judge if you have achieved Pure Black World Tendency. This demon will still be there when the world is Pure Black. Your character's maximum HP in Soul Form is reduced. See the list of Black World Tendency Events. There are a number of ways to determine a World's Tendency. From the menu, navigate to the World Tendency tab and check the images of the Archstone in question. It will range from bright white to neutral gray to pure black. After entering the World, observe the top right of the screen. The circle in the corner displays the World Tendency, similar to the above example. Keep track of the "score board" for a particular world (see below). This game is quite brutal and most players will probably struggle a bit on their first playthrough, so if players want to play through however they want, that works too. It may sound very demanding for a player to try to attain Pure White World Tendency during their first playthrough. It's not required by any means, but considering that New Game+ is significantly more difficult than a regular New Game, getting both White and Black world tendencies in the first playthrough is probably a good idea. Many players have no problem getting the White and Black tendencies in New Game+, so the decision is really up to the individual player. Whenever playing online, the world tendencies will shift towards an invisible unpublished global server tendency setting. Because of this, it will make it hard to keep the pure black or white states as desired, therefore it is strongly recommended to play in offline mode when controlling the world tendencies. These tendencies change on certain Holidays, such as Halloween. 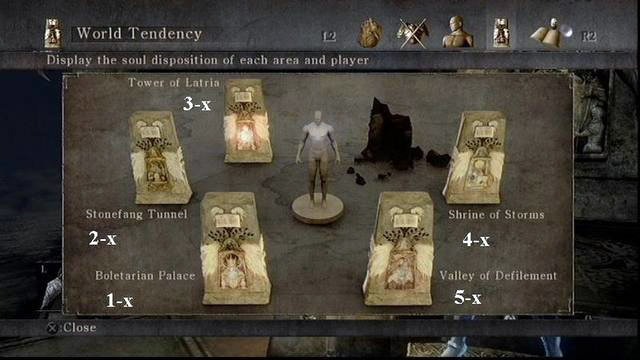 Example: to achieve Pure White World Tendency (PWWT) in Boletaria: play in soul form (or in body form without dying); kill Phalanx (+1) in 1-1; kill the Red Dragon (+1) in 1-2; kill the Tower Knight (+1) in 1-2. This yields PWWT, after you go back to Nexus. If you then kill Executioner Miralda (-3) you go back to neutral. Each action below is followed by a positive or negative number. Note: To maintain White Tendency after defeating a boss (approx 45% shift to White), then go to the Nexus and commit suicide in the Nexus. Death in body form in a world equates to a (30%) shift back to black tendency, undoing all the effect of killing the boss. In the unpatched Asian version; contrary to popular belief, you can suicide in Soul Form to move World Tendency towards Pure Black (Offline). Untested in North American version. Suicide in the Nexus in Body Form (+0) This affects World Tendency in the Nexus, but there are no World Tendency events there. When in Soul Form the amount of health available correlates to Character Tendency and World Tendency. The table below shows the maximum HP in Soul Form as a percentage of available health in Body Form (100%).